The Staff Selection Commission (SSC) has released the notification and is going to conduct Combined Higher Secondary Level (CHSL) LDC DEO 2015 Tier-2 examination on 18th September 2016. Earlier, the commission has carried out the Tier-1 examination, and the results of the same were also declared. Candidates who had qualified in the Tier-I have to attend for the Tier-II examination and download SSC chsl tier 2 admit card 2016. According to the official notification, the Commission has issued the SSC CHSL Tier 2 Admit card 2016 on their official website ssc.nic.in. The SSC CHSL Tier II Hall Ticket is the crucial document to carry examination and contains details regarding exam venue, roll number, SSC CHSL Tier-2 Exam date, etc. The officials are going to issue the Tier-2 e-Admit card regional wise soon. Staff Selection Commission is a government organisation, established and has its main hub at New Delhi, India. The primary responsibility of the commission is to conduct various examinations like CGL, CHSL, Steno ‘C’ & ‘D’, JE, CAPF, GD-Constable, JHT and others. It conducts examinations for the recruitment of skilled candidates in various government departments. This year also SSC has conduct CHSL exam across India for the recruitment of LDC, DEO, PA & SA posts. Candidates who had cleared the stage-1 exam can download SSC CHSL Tier 2 Admit card 2016 from the official website ssc.nic.in. SSC will conduct the CHSL exam in three levels viz., Tier I, Tier II and Tier III. The Tier 1 exam is objective type. Tier 2 test will be conducted on essay and letter or application writing skill. Candidates selected for Tier 3 exam have to undergo on skill test or typing test. The final merit of the selected candidates would be drawn on the basis of total score obtained by them in Tier 1 and Tier 2. The exam will be in a pen and paper mode, and the exam will be hand written and not computer based. The descriptive paper, written either in Hindi or English will be conducted for total 100 marks. The paper would comprise writing of an essay of 200-250 words and letter/application writing of approximately 150-200 words. The time duration of the examination is one hour. The minimum qualifying marks would be 33 %, the performance in Tier 2 would be included for preparing merit. From the official web portal of Staff Selection Commission, all the qualified candidates can download the SSC CHSL Tier 2 Admit card 2016 by entering the required details. Applicants who select in this Tier-II examination will be called for typing test or skill test. 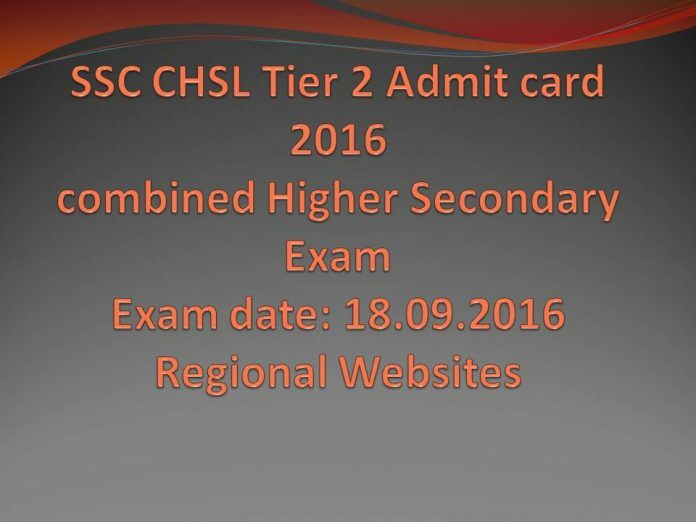 SSC CHSL Tier II admit card will be available at regional websites of SSC i.e. North Western, North eastern, Eastern, Kerala Karnataka, Southern, Western, Madhya Pradesh Sub, Central regions.